Hundreds of children were sexually abused over at least 40 years by priests and other religious leaders in the Diocese of Altoona-Johnstown, a statewide grand jury found. At least 50 priests or religious leaders were involved in the abuse and diocesan leaders systematically concealed the abuse to protect the church's image, according to a grand jury report released on March 1 by Attorney General Kathleen G. Kane. Tony DeGol, diocesan secretary for communications, said in a statement that the diocese had received the report and was reviewing it. The diocese pledged to continue cooperating with authorities in their investigation "as part of our commitment to the safety of all children," the statement said. "This is a painful and difficult time in our diocesan church," Bishop Mark L. Bartchak of Altoona-Johnstown said in the statement. "I deeply regret any harm that has come to children, and I urge the faithful to join me in praying for all victims of abuse." Kane's office began investigating abuse claims in 2012 and after two years asked the grand jury to hear evidence that had been gathered. By then the grand jury could not indict any of the suspected abusers because the state's statute of limitations had expired. Amy B. Hill, spokesperson for the Pennsylvania Catholic Conference, said in an emailed statement that the state's statute of limitations on sexual abuse cases has been raised over the years from age 20 to age 50 for criminal prosecutions and age 20 to age 30 for civil actions. The report provides details of abuse—sometimes in graphic language—by 34 priests against hundreds of victims, some of whom Kane said were as young as 8 years old. It said other complaints had been made against a teacher who was studying to become a deacon, a choirmaster, a coach and members of religious orders. 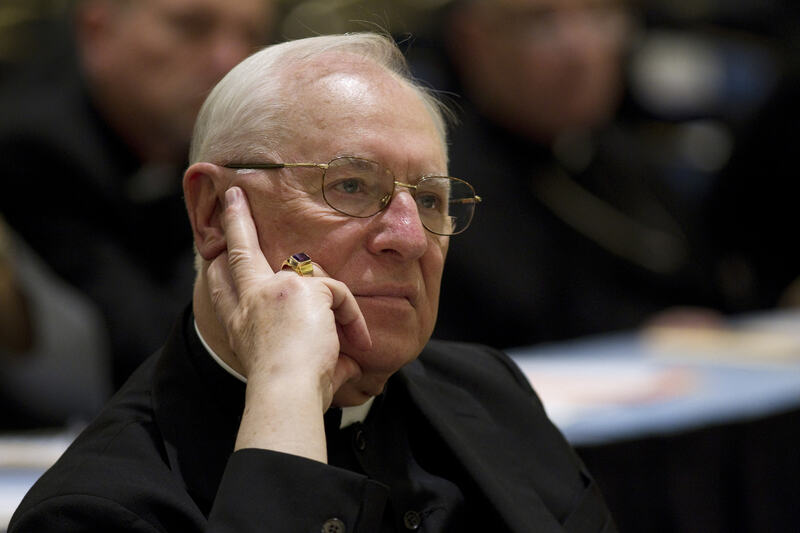 Grand jurors outlined actions by Bishop James J. Hogan, who led the diocese form 1966 until 1986 when he retired—he died in 2005—and his successor, Bishop Joseph V. Adamec, who retired in 2011, for failing to report abuse allegations to police. Kane said both bishops covered up the abuse to protect the church's image. A raid on diocesan offices in August in Hollidaysburg, near Altoona, led to the discovery of what Kane called a "secret archive." Officials with Kane's office uncovered dozens of handwritten notes by Bishop Hogan, letters and documents sent to Bishop Adamec, statements from abuse victims, correspondence with offending priests and internal correspondence on clergy abuse matters, the report said. The report questioned the effectiveness of the diocese's Allegation Review Board, which as established under the "Charter for the Protection of Children and Young People" adopted by the U.S. Conference of Catholic Bishops in 2002. It said that Bishop Adamec appointed its members and that its recommendations went through the bishops' office for review. Kane's office also established a hotline for people to report abuse allegations. Victims and witnesses can call (888) 538-8541 to offer information they may have about suspected abuse.